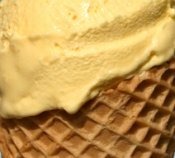 Today I heard two expressions relating to ice cream that I had NEVER heard before - ice cream poke and ice cream slider. My family and I were visiting some dear friends (whose hospitality is always wonderful) and amongst our many topics of conversation - eg. the history of the Titanic, big band jazz, making ceramics and the technology of acoustics - we started talking about ice cream. Now these friends know about my passion for ice cream and indeed I helped them get an electric ice cream maker of their own which they use regularly to try out my ice cream recipes. So you would think that having discussed ice cream with them before, there could be no way of them using terms completely unfamiliar to me ... but they did. You see Don was born in Belfast (which I pronounce as "bellfast" but he insists should be said as "belfarst") and on recalling childhood memories of ice cream he suddenly referred to ice cream pokes and ice cream sliders. Having returned home, I had to look this up! Apparently, these expressions are used throughout Ireland and also parts of Scotland. The ice cream poke expression interested me most and after a little digging what I discovered made perfect sense. I had heard the expression "a pig in a poke" before but never stopped to think about it. Apparently, one meaning of the word 'poke' is a sack or bag - a definition dating back over 600 years to medieval England! So it's totally logical to use the word to describe a cone for holding ice cream. Great to have an English lesson from an Irishman!